Comparison: most brown dwarfs are only slightly larger than Jupiter (10–15%) but up to 80 times more massive due to greater density. Image is approximately to scale, with Jupiter's radius 10 times that of Earth, and the Sun's radius 10 times that of Jupiter. A brown dwarf is a type of substellar object occupying the mass range between the heaviest gas giant planets and the lightest stars, having a mass between approximately 13 to 75–80 times that of Jupiter (MJ), or approximately 7028249999999999999♠2.5×1028 kg to about 7029150000000000000♠1.5×1029 kg. Below this range are the sub-brown dwarfs (sometimes referred to as rogue planets), and above it are the lightest red dwarfs (M9 V). Brown dwarfs may be fully convective, with no layers or chemical differentiation by depth. Unlike the stars in the main sequence, brown dwarfs are not massive enough to sustain nuclear fusion of ordinary hydrogen (1H) to helium in their cores. They are, however, thought to fuse deuterium (2H) and to fuse lithium (7Li) if their mass is above a debated threshold of 13 MJ and 65 MJ, respectively. It is also debated whether brown dwarfs would be better defined by their formation processes rather than by their supposed nuclear fusion reactions. Stars are categorized by spectral class, with brown dwarfs designated as types M, L, T, and Y. Despite their name, brown dwarfs are of different colors. Many brown dwarfs would likely appear magenta to the human eye, or possibly orange/red. Brown dwarfs are not very luminous at visible wavelengths. There are planets known to orbit brown dwarfs: 2M1207b, MOA-2007-BLG-192Lb, and 2MASS J044144b. At a distance of about 6.5 light years, the nearest known brown dwarf is Luhman 16, a binary system of brown dwarfs discovered in 2013. HR 2562 b is listed as the most-massive known exoplanet (as of December 2017) in NASA's exoplanet archive, despite having a mass (7001300000000000000♠30±15 MJ) more than twice the 13-Jupiter-mass cutoff between planets and brown dwarfs. The objects now called "brown dwarfs" were theorized to exist in the 1960s by Shiv S. Kumar and were originally called black dwarfs, a classification for dark substellar objects floating freely in space that were not massive enough to sustain hydrogen fusion. However: (a) the term black dwarf was already in use to refer to a cold white dwarf; (b) red dwarfs fuse hydrogen; and (c) these objects may be luminous at visible wavelengths early in their lives. Because of this, alternative names for these objects were proposed, including planetar and substar. In 1975, Jill Tarter suggested the term "brown dwarf", using "brown" as an approximate color. The term "black dwarf" still refers to a white dwarf that has cooled to the point that it no longer emits significant amounts of light. However, the time required for even the lowest-mass white dwarf to cool to this temperature is calculated to be longer than the current age of the universe; hence such objects are expected to not yet exist. Early theories concerning the nature of the lowest-mass stars and the hydrogen-burning limit suggested that a population I object with a mass less than 0.07 solar masses (M☉) or a population II object less than 0.09 M☉ would never go through normal stellar evolution and would become a completely degenerate star. The first self-consistent calculation of the hydrogen-burning minimum mass confirmed a value between 0.08 and 0.07 solar masses for population I objects. The discovery of deuterium burning down to 0.012 solar masses and the impact of dust formation in the cool outer atmospheres of brown dwarfs in the late 1980s brought these theories into question. However, such objects were hard to find because they emit almost no visible light. Their strongest emissions are in the infrared (IR) spectrum, and ground-based IR detectors were too imprecise at that time to readily identify any brown dwarfs. Since then, numerous searches by various methods have sought these objects. These methods included multi-color imaging surveys around field stars, imaging surveys for faint companions of main-sequence dwarfs and white dwarfs, surveys of young star clusters, and radial velocity monitoring for close companions. For many years, efforts to discover brown dwarfs were fruitless. In 1988, however, a faint companion to a star known as GD 165 was found in an infrared search of white dwarfs. The spectrum of the companion GD 165B was very red and enigmatic, showing none of the features expected of a low-mass red dwarf. It became clear that GD 165B would need to be classified as a much cooler object than the latest M dwarfs then known. GD 165B remained unique for almost a decade until the advent of the Two Micron All-Sky Survey (2MASS) which discovered many objects with similar colors and spectral features. Today, GD 165B is recognized as the prototype of a class of objects now called "L dwarfs". Although the discovery of the coolest dwarf was highly significant at the time, it was debated whether GD 165B would be classified as a brown dwarf or simply a very-low-mass star, because observationally it is very difficult to distinguish between the two. Soon after the discovery of GD 165B, other brown-dwarf candidates were reported. Most failed to live up to their candidacy, however, because the absence of lithium showed them to be stellar objects. True stars burn their lithium within a little over 100 Myr, whereas brown dwarfs (which can, confusingly, have temperatures and luminosities similar to true stars) will not. Hence, the detection of lithium in the atmosphere of an object older than 100 Myr ensures that it is a brown dwarf. In 1995, the study of brown dwarfs changed substantially with the discovery of two indisputable substellar objects – Teide 1 and Gliese 229B – which were identified by the presence of the 670.8 nm lithium line. The latter was found to have a temperature and luminosity well below the stellar range. Its near-infrared spectrum clearly exhibited a methane absorption band at 2 micrometres, a feature that had previously only been observed in the atmospheres of giant planets and that of Saturn's moon Titan. Methane absorption is not expected at any temperature of a main-sequence star. This discovery helped to establish yet another spectral class even cooler than L dwarfs, known as "T dwarfs", for which Gliese 229B is the prototype. The first confirmed brown dwarf was discovered by Spanish astrophysicists Rafael Rebolo (head of team), María Rosa Zapatero Osorio, and Eduardo Martín in 1994. This object, found in the Pleiades open cluster, received the name Teide 1. The discovery article was submitted to Nature in May 1995, and published on 14 September 1995. Nature highlighted "Brown dwarfs discovered, official" in the front page of that issue. Teide 1 was discovered in images collected by the IAC team on 6 January 1994 using the 80 cm telescope (IAC 80) at Teide Observatory and its spectrum was first recorded in December 1994 using the 4.2 m William Herschel Telescope at Roque de los Muchachos Observatory (La Palma). The distance, chemical composition, and age of Teide 1 could be established because of its membership in the young Pleiades star cluster. Using the most advanced stellar and substellar evolution models at that moment, the team estimated for Teide 1 a mass of 55 ± 15 MJ, which is below the stellar-mass limit. The object became a reference in subsequent young brown dwarf related works. In theory, a brown dwarf below 65 MJ is unable to burn lithium by thermonuclear fusion at any time during its evolution. This fact is one of the lithium test principles used to judge the substellar nature of low-luminosity and low-surface-temperature astronomical bodies. High-quality spectral data acquired by the Keck 1 telescope in November 1995 showed that Teide 1 still had the initial lithium abundance of the original molecular cloud from which Pleiades stars formed, proving the lack of thermonuclear fusion in its core. These observations confirmed that Teide 1 is a brown dwarf, as well as the efficiency of the spectroscopic lithium test. For some time, Teide 1 was the smallest known object outside the Solar System that had been identified by direct observation. Since then, over 1,800 brown dwarfs have been identified, even some very close to Earth like Epsilon Indi Ba and Bb, a pair of brown dwarfs gravitationally bound to a Sun-like star 12 light-years from the Sun, and Luhman 16, a binary system of brown dwarfs at 6.5 light-years from the Sun. The standard mechanism for star birth is through the gravitational collapse of a cold interstellar cloud of gas and dust. As the cloud contracts it heats due to the Kelvin–Helmholtz mechanism. Early in the process the contracting gas quickly radiates away much of the energy, allowing the collapse to continue. Eventually, the central region becomes sufficiently dense to trap radiation. Consequently, the central temperature and density of the collapsed cloud increases dramatically with time, slowing the contraction, until the conditions are hot and dense enough for thermonuclear reactions to occur in the core of the protostar. For most stars, gas and radiation pressure generated by the thermonuclear fusion reactions within the core of the star will support it against any further gravitational contraction. Hydrostatic equilibrium is reached and the star will spend most of its lifetime fusing hydrogen into helium as a main-sequence star. This means that the protostar is not massive enough and not dense enough to ever reach the conditions needed to sustain hydrogen fusion. The infalling matter is prevented, by electron degeneracy pressure, from reaching the densities and pressures needed. Further gravitational contraction is prevented and the result is a "failed star", or brown dwarf that simply cools off by radiating away its internal thermal energy. Lithium is generally present in brown dwarfs and not in low-mass stars. Stars, which reach the high temperature necessary for fusing hydrogen, rapidly deplete their lithium. Fusion of lithium-7 and a proton occurs producing two helium-4 nuclei. The temperature necessary for this reaction is just below that necessary for hydrogen fusion. Convection in low-mass stars ensures that lithium in the whole volume of the star is eventually depleted. Therefore, the presence of the lithium spectral line in a candidate brown dwarf is a strong indicator that it is indeed a substellar object. The use of lithium to distinguish candidate brown dwarfs from low-mass stars is commonly referred to as the lithium test, and was pioneered by Rafael Rebolo, Eduardo Martín and Antonio Magazzu. However, lithium is also seen in very young stars, which have not yet had enough time to burn it all. Heavier stars, like the Sun, can also retain lithium in their outer layers, which never get hot enough to fuse lithium, and whose convective layer does not mix with the core where the lithium would be rapidly depleted. Those larger stars are easily distinguishable from brown dwarfs by their size and luminosity. Conversely, brown dwarfs at the high end of their mass range can be hot enough to deplete their lithium when they are young. Dwarfs of mass greater than 65 MJ can burn their lithium by the time they are half a billion years old, thus the lithium test is not perfect. Unlike stars, older brown dwarfs are sometimes cool enough that, over very long periods of time, their atmospheres can gather observable quantities of methane which cannot form in hotter objects. Dwarfs confirmed in this fashion include Gliese 229B. Main-sequence stars cool, but eventually reach a minimum bolometric luminosity that they can sustain through steady fusion. This varies from star to star, but is generally at least 0.01% that of the Sun. Brown dwarfs cool and darken steadily over their lifetimes: sufficiently old brown dwarfs will be too faint to be detectable. Iron rain as part of atmospheric convection processes is possible only in brown dwarfs, and not in small stars. The spectroscopy research into iron rain is still ongoing, but not all brown dwarfs will always have this atmospheric anomaly. In 2013, a heterogeneous iron-containing atmosphere was imaged around the B component in the close Luhman 16 system. Like stars, brown dwarfs form independently, but, unlike stars, lack sufficient mass to "ignite". Like all stars, they can occur singly or in close proximity to other stars. Some orbit stars and can, like planets, have eccentric orbits. Brown dwarfs are all roughly the same radius as Jupiter. At the high end of their mass range (60–90 MJ), the volume of a brown dwarf is governed primarily by electron-degeneracy pressure, as it is in white dwarfs; at the low end of the range (10 MJ), their volume is governed primarily by Coulomb pressure, as it is in planets. The net result is that the radii of brown dwarfs vary by only 10–15% over the range of possible masses. This can make distinguishing them from planets difficult. In addition, many brown dwarfs undergo no fusion; those at the low end of the mass range (under 13 MJ) are never hot enough to fuse even deuterium, and even those at the high end of the mass range (over 60 MJ) cool quickly enough that after 10 million years they no longer undergo fusion. X-ray and infrared spectra are telltale signs of brown dwarfs. Some emit X-rays; and all "warm" dwarfs continue to glow tellingly in the red and infrared spectra until they cool to planet-like temperatures (under 1000 K). Gas giants have some of the characteristics of brown dwarfs. Like the Sun, Jupiter and Saturn are both made primarily of hydrogen and helium. Saturn is nearly as large as Jupiter, despite having only 30% the mass. Three of the giant planets in the Solar System (Jupiter, Saturn, and Neptune) emit much more (up to about twice) heat than they receive from the Sun. And all four giant planets have their own "planetary" systems – their moons. Currently, the International Astronomical Union considers an object above 13 MJ (the limiting mass for thermonuclear fusion of deuterium) to be a brown dwarf, whereas an object under that mass (and orbiting a star or stellar remnant) is considered a planet. The 13 Jupiter-mass cutoff is a rule of thumb rather than something of precise physical significance. Larger objects will burn most of their deuterium and smaller ones will burn only a little, and the 13 Jupiter mass value is somewhere in between. The amount of deuterium burnt also depends to some extent on the composition of the object, specifically on the amount of helium and deuterium present and on the fraction of heavier elements, which determines the atmospheric opacity and thus the radiative cooling rate. The Extrasolar Planets Encyclopaedia includes objects up to 25 Jupiter masses, and the Exoplanet Data Explorer up to 24 Jupiter masses. Objects below 13 MJ, called sub-brown dwarf or planetary-mass brown dwarf, form in the same manner as stars and brown dwarfs (i.e. through the collapse of a gas cloud) but have a mass below the limiting mass for thermonuclear fusion of deuterium. Some researchers call them free-floating planets, whereas others call them planetary-mass brown dwarfs. These are brown dwarfs with a spectral class of M6.5 or later; they are also called late-M dwarfs. These can be considered red dwarfs in the eyes of some scientists. The defining characteristic of spectral class M, the coolest type in the long-standing classical stellar sequence, is an optical spectrum dominated by absorption bands of titanium(II) oxide (TiO) and vanadium(II) oxide (VO) molecules. However, GD 165B, the cool companion to the white dwarf GD 165, had none of the hallmark TiO features of M dwarfs. The subsequent identification of many objects like GD 165B ultimately led to the definition of a new spectral class, the L dwarfs, defined in the red optical region of the spectrum not by metal-oxide absorption bands (TiO, VO), but by metal hydride emission bands (FeH, CrH, MgH, CaH) and prominent atomic lines of alkali metals (NaI, KI, CsI, RbI). As of 2013[update], over 900 L dwarfs have been identified, most by wide-field surveys: the Two Micron All Sky Survey (2MASS), the Deep Near Infrared Survey of the Southern Sky (DENIS), and the Sloan Digital Sky Survey (SDSS). This spectral class contains not only the brown dwarfs, because the coolest main-sequence stars above brown dwarfs (> 80 MJ) have the spectral class L2 or L3. As GD 165B is the prototype of the L dwarfs, Gliese 229B is the prototype of a second new spectral class, the T dwarfs. Whereas near-infrared (NIR) spectra of L dwarfs show strong absorption bands of H2O and carbon monoxide (CO), the NIR spectrum of Gliese 229B is dominated by absorption bands from methane (CH4), features that were only found in the giant planets of the Solar System and Titan. CH4, H2O, and molecular hydrogen (H2) collision-induced absorption (CIA) give Gliese 229B blue near-infrared colors. Its steeply sloped red optical spectrum also lacks the FeH and CrH bands that characterize L dwarfs and instead is influenced by exceptionally broad absorption features from the alkali metals Na and K. These differences led Kirkpatrick to propose the T spectral class for objects exhibiting H- and K-band CH4 absorption. As of 2013[update], 355 T dwarfs are known. NIR classification schemes for T dwarfs have recently been developed by Adam Burgasser and Tom Geballe. Theory suggests that L dwarfs are a mixture of very-low-mass stars and sub-stellar objects (brown dwarfs), whereas the T dwarf class is composed entirely of brown dwarfs. Because of the absorption of sodium and potassium in the green part of the spectrum of T dwarfs, the actual appearance of T dwarfs to human visual perception is estimated to be not brown, but the color of magenta. T-class brown dwarfs, such as WISE 0316+4307, have been detected over 100 light-years from the Sun. There is some doubt as to what, if anything, should be included in the class Y dwarfs. They are expected to be much cooler than T-dwarfs. They have been modelled, though there is no well-defined spectral sequence yet with prototypes. In 2009, the coolest known brown dwarfs had estimated effective temperatures between 500 and 600 K, and have been assigned the spectral class T9. Three examples are the brown dwarfs CFBDS J005910.90-011401.3, ULAS J133553.45+113005.2, and ULAS J003402.77−005206.7. The spectra of these objects have absorption peaks around 1.55 micrometers. Delorme et al. have suggested that this feature is due to absorption from ammonia and that this should be taken as indicating the T–Y transition, making these objects of type Y0. However, the feature is difficult to distinguish from absorption by water and methane, and other authors have stated that the assignment of class Y0 is premature. In April 2010, two newly discovered ultracool sub-brown dwarfs (UGPS 0722-05 and SDWFS 1433+35) were proposed as prototypes for spectral class Y0. In February 2011, Luhman et al. reported the discovery of a "brown dwarf" companion to a nearby white dwarf with a temperature of c. 300 K and mass of 7 MJ. Though of planetary mass, Rodriguez et al. suggest it is unlikely to have formed in the same manner as planets. Shortly after that, Liu et al. published an account of a "very cold" (c. 370 K) brown dwarf orbiting another very-low-mass brown dwarf and noted that "Given its low luminosity, atypical colors and cold temperature, CFBDS J1458+10B is a promising candidate for the hypothesized Y spectral class." In August 2011, scientists using data from NASA's Wide-field Infrared Survey Explorer (WISE) discovered six "Y dwarfs"—star-like bodies with temperatures as cool as the human body. WISE data has revealed hundreds of new brown dwarfs. Of these, fourteen are classified as cool Ys. One of the Y dwarfs, called WISE 1828+2650, was, as of August 2011, the record holder for the coldest brown dwarf – emitting no visible light at all, this type of object resembles free-floating planets more than stars. WISE 1828+2650 was initially estimated to have an atmospheric temperature cooler than 300 K—for comparison, the upper end of room temperature is 298 K (25 °C; 77 °F). Its temperature has since been revised and newer estimates put it in the range of 250 to 400 K (−23 to 127 °C; −10 to 260 °F). In April 2014, WISE 0855−0714 was announced with a temperature profile estimated around 225 to 260 K (−48 to −13 °C; −55 to 8 °F) and a mass of 3 to 10 MJ. It was also unusual in that its observed parallax meant a distance close to 7.2±0.7 light years from the Solar System. The majority of flux emitted by L and T dwarfs is in the 1 to 2.5 micrometre near-infrared range. 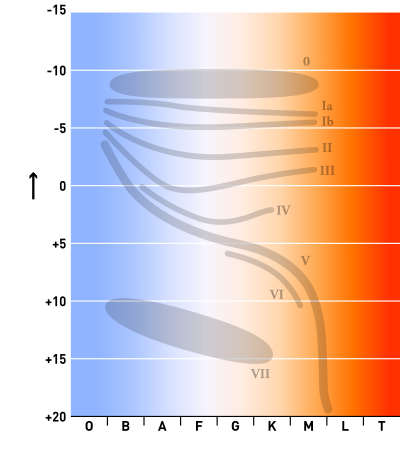 Low and decreasing temperatures through the late M-, L-, and T-dwarf sequence result in a rich near-infrared spectrum containing a wide variety of features, from relatively narrow lines of neutral atomic species to broad molecular bands, all of which have different dependencies on temperature, gravity, and metallicity. Furthermore, these low temperature conditions favor condensation out of the gas state and the formation of grains. Typical atmospheres of known brown dwarfs range in temperature from 2200 down to 750 K. Compared to stars, which warm themselves with steady internal fusion, brown dwarfs cool quickly over time; more massive dwarfs cool more slowly than less massive ones. Coronagraphs have recently been used to detect faint objects orbiting bright visible stars, including Gliese 229B. Sensitive telescopes equipped with charge-coupled devices (CCDs) have been used to search distant star clusters for faint objects, including Teide 1. Wide-field searches have identified individual faint objects, such as Kelu-1 (30 ly away). Brown dwarfs are often discovered in surveys to discover extrasolar planets. Methods of detecting extrasolar planets work for brown dwarfs as well, although brown dwarfs are much easier to detect. Brown dwarfs can be powerful emitters of radio emission due to their strong magnetic fields. Observing programs at the Arecibo Observatory and the Very Large Array have detected over a dozen such objects, which are also called ultracool dwarfs because they share common magnetic properties with other objects in this class. The detection of radio emission from brown dwarfs permits their magnetic field strengths to be measured directly. 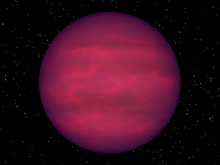 1995: First brown dwarf verified. Teide 1, an M8 object in the Pleiades cluster, is picked out with a CCD in the Spanish Observatory of Roque de los Muchachos of the Instituto de Astrofísica de Canarias. First methane brown dwarf verified. Gliese 229B is discovered orbiting red dwarf Gliese 229A (20 ly away) using an adaptive optics coronagraph to sharpen images from the 60-inch (1.5 m) reflecting telescope at Palomar Observatory on Southern California's Mt. Palomar; follow-up infrared spectroscopy made with their 200-inch (5 m) Hale telescope shows an abundance of methane. 1998: First X-ray-emitting brown dwarf found. Cha Halpha 1, an M8 object in the Chamaeleon I dark cloud, is determined to be an X-ray source, similar to convective late-type stars. 15 December 1999: First X-ray flare detected from a brown dwarf. A team at the University of California monitoring LP 944-20 (60 MJ, 16 ly away) via the Chandra X-ray Observatory, catches a 2-hour flare. 27 July 2000: First radio emission (in flare and quiescence) detected from a brown dwarf. A team of students at the Very Large Array detected emission from LP 944-20. 25 April 2014: Coldest known brown dwarf discovered. WISE 0855−0714 is 7.2 light-years away (7th closest system to the Sun) and has a temperature between −48 to −13 degrees Celsius. X-ray flares detected from brown dwarfs since 1999 suggest changing magnetic fields within them, similar to those in very-low-mass stars. With no strong central nuclear energy source, the interior of a brown dwarf is in a rapid boiling, or convective state. When combined with the rapid rotation that most brown dwarfs exhibit, convection sets up conditions for the development of a strong, tangled magnetic field near the surface. The flare observed by Chandra from LP 944-20 could have its origin in the turbulent magnetized hot material beneath the brown dwarf's surface. A sub-surface flare could conduct heat to the atmosphere, allowing electric currents to flow and produce an X-ray flare, like a stroke of lightning. The absence of X-rays from LP 944-20 during the non-flaring period is also a significant result. It sets the lowest observational limit on steady X-ray power produced by a brown dwarf, and shows that coronas cease to exist as the surface temperature of a brown dwarf cools below about 2800K and becomes electrically neutral. Using NASA's Chandra X-ray Observatory, scientists have detected X-rays from a low-mass brown dwarf in a multiple star system. This is the first time that a brown dwarf this close to its parent star(s) (Sun-like stars TWA 5A) has been resolved in X-rays. "Our Chandra data show that the X-rays originate from the brown dwarf's coronal plasma which is some 3 million degrees Celsius", said Yohko Tsuboi of Chuo University in Tokyo. "This brown dwarf is as bright as the Sun today in X-ray light, while it is fifty times less massive than the Sun", said Tsuboi. "This observation, thus, raises the possibility that even massive planets might emit X-rays by themselves during their youth!" Brown dwarfs can maintain magnetic fields of up to 6 kG in strength. Approximately 5–10% of brown dwarfs appear to have strong magnetic fields and emit radio waves, and there may be as many as 40 magnetic brown dwarfs within 25 pc of the Sun based on Monte Carlo modeling and their average spatial density. The regular, periodic reversal of radio wave orientation may indicate that brown dwarf magnetic fields periodically reverse orientation. These reversals may be the result of a brown dwarf magnetic activity cycle, similar to the solar cycle. The brown dwarf Cha 110913-773444, located 500 light years away in the constellation Chamaeleon, may be in the process of forming a miniature planetary system. Astronomers from Pennsylvania State University have detected what they believe to be a disk of gas and dust similar to the one hypothesized to have formed the Solar System. Cha 110913-773444 is the smallest brown dwarf found to date (8 MJ), and if it formed a planetary system, it would be the smallest known object to have one. 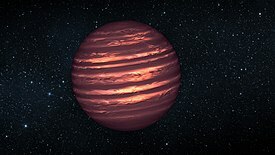 Recent observations of known brown dwarf candidates have revealed a pattern of brightening and dimming of infrared emissions that suggests relatively cool, opaque cloud patterns obscuring a hot interior that is stirred by extreme winds. The weather on such bodies is thought to be extremely violent, comparable to but far exceeding Jupiter's famous storms. On January 8, 2013 astronomers using NASA's Hubble and Spitzer space telescopes probed the stormy atmosphere of a brown dwarf named 2MASS J22282889-431026, creating the most detailed "weather map" of a brown dwarf thus far. It shows wind-driven, planet-sized clouds. The new research is a stepping stone toward a better understanding not only brown dwarfs, but also of the atmospheres of planets beyond the Solar System. NASA's WISE mission has detected 200 new brown dwarfs. There are actually fewer brown dwarfs in our cosmic neighborhood than previously thought. Rather than one star for every brown dwarf, there may be as many as six stars for every brown dwarf. In a study published in Aug 2017 NASA's Spitzer Space Telescope monitored infrared brightness variations in brown dwarfs caused by cloud cover of variable thickness. The observations revealed that large-scale waves propagating in the atmospheres of brown dwarfs (similarly to the atmosphere of Neptune and other Solar System giant planets). These atmospheric waves modulate the thickness of the clouds and propagate with different velocities (probably due to differential rotation). The super-Jupiter planetary-mass objects 2M1207b and 2MASS J044144 that are orbiting brown dwarfs at large orbital distances may have formed by cloud collapse rather than accretion and so may be sub-brown dwarfs rather than planets, which is inferred from relatively large masses and large orbits. The first discovery of a low-mass companion orbiting a brown dwarf (ChaHα8) at a small orbital distance using the radial velocity technique paved the way for the detection of planets around brown dwarfs on orbits of a few AU or smaller. However, with a mass ratio between the companion and primary in ChaHα8 of about 0.3, this system rather resembles a binary star. Then, in 2013, the first planetary-mass companion (OGLE-2012-BLG-0358L b) in a relatively small orbit was discovered orbiting a brown dwarf. In 2015, the first terrestrial-mass planet orbiting a brown dwarf was found, OGLE-2013-BLG-0723LBb. Disks around brown dwarfs have been found to have many of the same features as disks around stars; therefore, it is expected that there will be accretion-formed planets around brown dwarfs. Given the small mass of brown dwarf disks, most planets will be terrestrial planets rather than gas giants. If a giant planet orbits a brown dwarf across our line of sight, then, because they have approximately the same diameter, this would give a large signal for detection by transit. The accretion zone for planets around a brown dwarf is very close to the brown dwarf itself, so tidal forces would have a strong effect. Planets around brown dwarfs are likely to be carbon planets depleted of water. A 2016 study, based upon observations with Spitzer estimates that 175 brown dwarfs need to be monitored in order to guarantee (95%) at least one detection of a planet. Habitability for hypothetical planets orbiting brown dwarfs has been studied. Computer models suggesting conditions for these bodies to have habitable planets are very stringent, the habitable zone being narrow and decreasing with time, due to the cooling of the brown dwarf. The orbits there would have to be of extremely low eccentricity (of the order of 10−6) to avoid strong tidal forces that would trigger a greenhouse effect on the planets, rendering them uninhabitable. WD 0137-349 B: first confirmed brown dwarf to have survived the primary's red giant phase. In 1984, it was postulated by some astronomers that the Sun may be orbited by an undetected brown dwarf (sometimes referred to as Nemesis) that could interact with the Oort cloud just as passing stars can. However, this hypothesis has fallen out of favor. Most massive SDSS J010448.46+153501.8 usdL1.5 01h04m48.46s +15°35'01.8" Pisces distance is ~180–290 pc, mass is ~88.5-91.7 MJ. Transitional brown dwarfs. Metal-poor SDSS J010448.46+153501.8 usdL1.5 01h04m48.46s +15°35'01.8" Pisces distance is ~180–290 pc, metallicity is ~0.004 ZSol. Transitional brown dwarfs. Most dense COROT-3b Transiting brown dwarf COROT-3b has 22 MJ with a diameter 1.01±0.07 times that of Jupiter. It is slightly denser than osmium at standard conditions. ^ a b Nicholos Wethington (October 6, 2008). "Dense Exoplanet Creates Classification Calamity". Universetoday.com. Retrieved January 30, 2013. ^ Ian O'Neill (13 September 2011). "Violent Storms Rage on Nearby Brown Dwarf". Discovery.com. Retrieved January 30, 2013. ^ a b c d e Burgasser, A. J. (June 2008). "Brown dwarfs: Failed stars, super Jupiters" (PDF). Physics Today. 61 (6): 70–71. Bibcode:2008PhT....61f..70B. doi:10.1063/1.2947658. Retrieved 11 January 2016. ^ Burrows, A.; Hubbard, W.B. ; Lunine, J.I. ; Liebert, J. (2001). "The Theory of Brown Dwarfs and Extrasolar Giant Planets". Reviews of Modern Physics. 73 (3): 719–765. arXiv:astro-ph/0103383. Bibcode:2001RvMP...73..719B. doi:10.1103/RevModPhys.73.719. ^ a b Cain, Fraser (January 6, 2009). "If Brown Isn't a Color, What Color are Brown Dwarfs?". Retrieved 24 September 2013. ^ Staff. "HR 2562 b". Caltech. Retrieved 16 February 2017. ^ Kumar, Shiv S. (1962). "Study of Degeneracy in Very Light Stars". Astronomical Journal. 67: 579. Bibcode:1962AJ.....67S.579K. doi:10.1086/108658. ^ Croswell, Ken (1999). Planet Quest: The Epic Discovery of Alien Solar Systems. Oxford University Press. pp. 118–119. ISBN 9780192880833. ^ Kumar, S. (1963). "The Structure of Stars of Very Low Mass". Astrophysical Journal. 137: 1121. Bibcode:1963ApJ...137.1121K. doi:10.1086/147589. ^ Hayashi, C.; Nakano, T. (1963). "Evolution of Stars of Small Masses in the Pre-Main-Sequence Stages". Progress of Theoretical Physics. 30 (4): 460–474. Bibcode:1963PThPh..30..460H. doi:10.1143/PTP.30.460. ^ Martin, E. L.; Basri, G.; Delfosse, X.; Forveille, T. (1997). "Keck HIRES spectra of the brown dwarf DENIS-P J1228.2-1547". Astronomy and Astrophysics. 327: L29–L32. Bibcode:1997A&A...327L..29M. ^ Kirkpatrick, J. D.; Reid, I. N.; Liebert, J.; Cutri, R. M.; Nelson, B.; Beichmann, C. A.; Dahn, C. C.; Monet, D. G.; Gizis, J. E.; Skrutskie, M. F. (1999). "Dwarfs Cooler than M: The Definition of Spectral Type L Using Discoveries from the 2 Micron All-Sky Survey (2MASS)" (PDF). The Astrophysical Journal. 519 (2): 802–833. Bibcode:1999ApJ...519..802K. doi:10.1086/307414. ^ Oppenheimer, Ben R. (2014). "Companions of Stars: From Other Stars to Brown Dwarfs to Planets and the Discovery of the First Methane Brown Dwarf". In Joergens, Viki (ed.). 50 Years of Brown Dwarfs. Astrophysics and Space Science Library. 401. Zurich: Springer. pp. 81–111. arXiv:1404.4430. doi:10.1007/978-3-319-01162-2_6. ISBN 978-3-319-01162-2. ^ "Instituto de Astrofísica de Canarias, IAC". Iac.es. Retrieved 2013-03-16. ^ Rebolo, R; Zapatero Osorio, M. R; Martín, E. L (1995). "Discovery of a brown dwarf in the Pleiades star cluster". Nature. 377 (6545): 129–131. Bibcode:1995Natur.377..129R. doi:10.1038/377129a0. ^ Leech, K. (2000). "Mid-IR Observations of the Pleiades Brown Dwarfs Teide 1 & Calar 3". ASP Conference Series. 212: 82–87. Bibcode:2000ASPC..212...82L. ^ Kulkarni, S. R. (30 May 1997). "Brown Dwarfs: A Possible Missing Link Between Stars and Planets". Science. 276 (5317): 1350–1354. Bibcode:1997Sci...276.1350K. doi:10.1126/science.276.5317.1350. ^ Biller, Beth A.; Crossfield, Ian J. M.; Mancini, Luigi; Ciceri, Simona; Southworth, John; Kopytova, Taisiya G.; Bonnefoy, Mickaël; Deacon, Niall R.; Schlieder, Joshua E.; Buenzli, Esther; Brandner, Wolfgang; Allard, France; Homeier, Derek; Freytag, Bernd; Bailer-Jones, Coryn A. L.; Greiner, Jochen; Henning, Thomas; Goldman, Bertrand (6 November 2013). "Weather on the Nearest Brown Dwarfs: Resolved Simultaneous Multi-Wavelength Variability Monitoring of WISE J104915.57–531906.1AB". The Astrophysical Journal Letters. 778 (1): L10. arXiv:1310.5144. Bibcode:2013ApJ...778L..10B. doi:10.1088/2041-8205/778/1/l10. ^ Gibor Basri; Brown (2006-08-20). "Planetesimals to Brown Dwarfs: What is a Planet?". Annu. Rev. Earth Planet. Sci. 34 (2006): 193–216. arXiv:astro-ph/0608417. Bibcode:2006AREPS..34..193B. doi:10.1146/annurev.earth.34.031405.125058. ^ "The Jovian Planets: Uranus, and Neptune". Archived from the original on 2012-01-18. Retrieved 2013-03-15. ^ "Cool Cosmos - Planets and Moons". Retrieved 2019-02-11. ^ "Working Group on Extrasolar Planets: Definition of a "Planet"". IAU position statement. 2003-02-28. Retrieved 2014-04-28. ^ Bodenheimer, P.; D'Angelo, G.; Lissauer, J. J.; Fortney, J. J.; Saumon, D. (2013). "Deuterium Burning in Massive Giant Planets and Low-mass Brown Dwarfs Formed by Core-nucleated Accretion". The Astrophysical Journal. 770 (2): 120 (13 pp.). arXiv:1305.0980. Bibcode:2013ApJ...770..120B. doi:10.1088/0004-637X/770/2/120. ^ Spiegel, David S.; Burrows, Adam; Milson, John A. (2011). "The Deuterium-Burning Mass Limit for Brown Dwarfs and Giant Planets". The Astrophysical Journal. 727 (1): 57. arXiv:1008.5150. Bibcode:2011ApJ...727...57S. doi:10.1088/0004-637X/727/1/57. ^ Delorme, P.; et al. (December 2012). "CFBDSIR2149-0403: a 4–7 Jupiter-mass free-floating planet in the young moving group AB Doradus?". Astronomy & Astrophysics. 548: A26. arXiv:1210.0305. Bibcode:2012A&A...548A..26D. doi:10.1051/0004-6361/201219984. ^ Luhman, K. L. (21 April 2014). "Discovery of a ~250 K Brown Dwarf at 2 pc from the Sun". The Astrophysical Journal Letters. 786 (2): L18. arXiv:1404.6501. Bibcode:2014ApJ...786L..18L. doi:10.1088/2041-8205/786/2/L18. ^ a b Burrows; et al. (2001). "The theory of brown dwarfs and extrasolar giant planets". Reviews of Modern Physics. 73 (3): 719–65. arXiv:astro-ph/0103383. Bibcode:2001RvMP...73..719B. doi:10.1103/RevModPhys.73.719. ^ a b Burningham, Ben; et al. (2008). "Exploring the substellar temperature regime down to ~550K". Monthly Notices of the Royal Astronomical Society. 391 (1): 320–333. arXiv:0806.0067. Bibcode:2008MNRAS.391..320B. doi:10.1111/j.1365-2966.2008.13885.x. ^ a b Luhman, K. L.; Burgasser, A. J.; Bochanski, J. J. (20 March 2011). "Discovery of a candidate for the coolest known brown dwarf". The Astrophysical Journal Letters. 730 (1): L9. arXiv:1102.5411. Bibcode:2011ApJ...730L...9L. doi:10.1088/2041-8205/730/1/L9. ^ Deacon; Hambly (2006). "The possiblity [sic] of detection of Ultracool Dwarfs with the UKIRT Infrared Deep Sky Survey". Monthly Notices of the Royal Astronomical Society. 371 (4): 1722–1730. arXiv:astro-ph/0607305. Bibcode:2006MNRAS.371.1722D. doi:10.1111/j.1365-2966.2006.10795.x. ^ a b c d Leggett, S. K; Cushing, Michael C; Saumon, D; Marley, M. S; Roellig, T. L; Warren, S. J; Burningham, Ben; Jones, H. R. A; Kirkpatrick, J. D; Lodieu, N; Lucas, P. W; Mainzer, A. K; Martín, E. L; McCaughrean, M. J; Pinfield, D. J; Sloan, G. C; Smart, R. L; Tamura, M; Van Cleve, J (2009). "The Physical Properties of Four ~600 K T Dwarfs". The Astrophysical Journal. 695 (2): 1517–1526. arXiv:0901.4093. Bibcode:2009ApJ...695.1517L. doi:10.1088/0004-637X/695/2/1517. .
^ a b Delorme, P; Delfosse, X; Albert, L; Artigau, E; Forveille, T; Reylé, C; Allard, F; Homeier, D; Robin, A. C; Willott, C. J; Liu, M. C; Dupuy, T. J (2008). "CFBDS J005910.90-011401.3: Reaching the T-Y brown dwarf transition?". Astronomy & Astrophysics. 482 (3): 961–971. arXiv:0802.4387. Bibcode:2008A&A...482..961D. doi:10.1051/0004-6361:20079317. ^ P. Eisenhart; Griffith, Roger L.; Stern, Daniel; Wright, Edward L.; Ashby, Matthew L. N.; Brodwin, Mark; Brown, Michael J. I.; Bussmann, R. S.; Dey, Arjun; Ghez, A. M.; Glikman, Eilat; Gonzalez, Anthony H.; Davy Kirkpatrick, J.; Konopacky, Quinn; Mainzer, Amy; Vollbach, David; Wright, Shelley A.; et al. (2010). "Ultracool Field Brown Dwarf Candidates Selected at 4.5 microns". The Astronomical Journal. 139 (6): 2455. arXiv:1004.1436. Bibcode:2010AJ....139.2455E. doi:10.1088/0004-6256/139/6/2455. ^ Rodriguez, David R.; Zuckerman, B.; Melis, Carl; Song, Inseok (10 May 2011). "The ultra cool brown dwarf companion of WD 0806-661B: age, mass, and formation mechanism". The Astrophysical Journal. 732 (2): L29. arXiv:1103.3544. Bibcode:2011ApJ...732L..29R. doi:10.1088/2041-8205/732/2/L29. ^ Liu, Michael C.; Philippe Delorme; Trent J. Dupuy; Brendan P. Bowler; Loic Albert; Etienne Artigau; Celine Reyle; Thierry Forveille; Xavier Delfosse (28 Feb 2011). "CFBDSIR J1458+1013B: A Very Cold (>T10) Brown Dwarf in a Binary System". The Astrophysical Journal. 740 (2): 108. arXiv:1103.0014. Bibcode:2011ApJ...740..108L. doi:10.1088/0004-637X/740/2/108. ^ Plait, Phil (24 August 2011). "WISE finds coolest brown dwarfs ever seen!". Discover Magazine. ^ "WISE Finds Few Brown Dwarfs Close To Home". 8 June 2012. ^ Morse, Jon. "Discovered: Stars as Cool as the Human Body". Retrieved 24 August 2011. ^ Beichman, C.; Gelino, Christopher R.; Kirkpatrick, J. Davy; Barman, Travis S.; Marsh, Kenneth A.; Cushing, Michael C.; Wright, E. L. (2013). "The Coldest Brown Dwarf (or Free-floating Planet)? : The Y Dwarf WISE 1828+2650". The Astrophysical Journal. 764 (1): 101. arXiv:1301.1669. Bibcode:2013ApJ...764..101B. doi:10.1088/0004-637X/764/1/101. ^ Clavin, Whitney; Harrington, J. D. (25 April 2014). "NASA's Spitzer and WISE Telescopes Find Close, Cold Neighbor of Sun". NASA.gov. Archived from the original on 26 April 2014. ^ Route, M.; Wolszczan, A. (20 October 2016). "The Second Arecibo Search for 5 GHz Radio Flares from Ultracool Dwarfs". The Astrophysical Journal. 830 (2): 85. arXiv:1608.02480. Bibcode:2016ApJ...830...85R. doi:10.3847/0004-637X/830/2/85. ^ Rutledge, Robert E.; Basri, Gibor; Martín, Eduardo L.; Bildsten, Lars (1 August 2000). "Chandra Detection of an X-Ray Flare from the Brown Dwarf LP 944-20". The Astrophysical Journal. 538 (2): L141–L144. arXiv:astro-ph/0005559. Bibcode:2000ApJ...538L.141R. doi:10.1086/312817. ^ a b Berger, E.; Ball, S.; Becker, K. M.; Clarke, M.; Frail, D. A.; Fukuda, T. A.; Hoffman, I. M.; Mellon, R.; Momjian, E.; Murphy, N. W.; Teng, S. H.; Woodruff, T.; Zauderer, B. A.; Zavala, R. T. (2001-03-15). "Discovery of radio emission from the brown dwarf LP944-20". Nature (Submitted manuscript). 410 (6826): 338–340. arXiv:astro-ph/0102301. Bibcode:2001Natur.410..338B. doi:10.1038/35066514. PMID 11268202. ^ "NASA's Spitzer and WISE Telescopes Find Close, Cold Neighbor of Sun". NASA. 2014-04-25. Retrieved 2017-03-11. ^ a b c d e "X-rays from a Brown Dwarf's Corona". April 14, 2003. ^ Kao, Melodie; et al. (31 July 2018). "The Strongest Magnetic Fields on the Coolest Brown Dwarfs". The Astrophysical Journal Supplement Series. 237 (2): 25. arXiv:1808.02485. Bibcode:2018ApJS..237...25K. doi:10.3847/1538-4365/aac2d5. ^ Route, Matthew; Wolszczan, Alexander (October 20, 2016). "The Second Arecibo Search for 5 GHz Radio Flares from Ultracool Dwarfs". The Astrophysical Journal. 830 (1): 85. arXiv:1608.02480. Bibcode:2016ApJ...830...85R. doi:10.3847/0004-637X/830/2/85. ^ Route, Matthew (August 10, 2017). "Radio-flaring Ultracool Dwarf Population Synthesis". The Astrophysical Journal. 845 (1): 66. arXiv:1707.02212. Bibcode:2017ApJ...845...66R. doi:10.3847/1538-4357/aa7ede. ^ Route, M. (20 October 2016). "The Discovery of Solar-like Activity Cycles Beyond the End of the Main Sequence?". The Astrophysical Journal Letters. 830 (2): L27. arXiv:1609.07761. Bibcode:2016ApJ...830L..27R. doi:10.3847/2041-8205/830/2/L27. ^ Luhman, K. L; Adame, Lucía; d'Alessio, Paola; Calvet, Nuria; Hartmann, Lee; Megeath, S. T; Fazio, G. G (2005). "Discovery of a Planetary-Mass Brown Dwarf with a Circumstellar Disk". The Astrophysical Journal. 635 (1): L93–L96. arXiv:astro-ph/0511807. Bibcode:2005ApJ...635L..93L. doi:10.1086/498868. ^ "NASA Space Telescopes See Weather Patterns in Brown Dwarf". Hubblesite. NASA. Retrieved 8 January 2013. ^ a b Ian O'Neill (Discovery News) (12 June 2012). "Brown Dwarfs, Runts of Stellar Litter, Rarer than Thought". Space.com. Retrieved 2012-12-28. ^ Apai, D; Karalidi, T; Marley, M. S; Yang, H; Flateau, D; Metchev, S; Cowan, N. B; Buenzli, E; Burgasser, A. J; Radigan, J; Artigau, E; Lowrance, P (2017). "Zones, spots, and planetary-scale waves beating in brown dwarf atmospheres". Science. 357 (6352): 683–687. Bibcode:2017Sci...357..683A. doi:10.1126/science.aam9848. PMID 28818943. ^ "Even Brown Dwarfs May Grow Rocky Planets". ESO Press Release. Retrieved 3 December 2012. ^ Joergens, V.; Müller, A. (2007). "16–20 MJup Radial Velocity Companion Orbiting the Brown Dwarf Candidate Cha Hα 8". The Astrophysical Journal. 666 (2): L113–L116. arXiv:0707.3744. Bibcode:2007ApJ...666L.113J. doi:10.1086/521825. ^ Joergens, V.; Müller, A.; Reffert, S. (2010). "Improved radial velocity orbit of the young binary brown dwarf candidate Cha Hα 8". Astronomy and Astrophysics. 521 (A24): A24. arXiv:1006.2383. Bibcode:2010A&A...521A..24J. doi:10.1051/0004-6361/201014853. ^ "First Planet Discovered Orbiting a Brown Dwarf". MIT Technology Review. 29 July 2013. Retrieved 29 July 2013. ^ Burrows, Adam; Hubbard, W. B; Lunine, J. I; Liebert, James; Kozłowski, S; Skowron, J; Poleski, R; Soszyński, I; Pietrukowicz, P; Mróz, P; Szymański, M. K; Wyrzykowski, Ł; Ulaczyk, K; Pietrzyński, G; Shvartzvald, Y; Maoz, D; Kaspi, S; Gaudi, B. S; Hwang, K.-H; Choi, J.-Y; Shin, I.-G; Park, H; Bozza, V (2015). "A Venus-Mass Planet Orbiting a Brown Dwarf: Missing Link between Planets and Moons". The Astrophysical Journal. 812 (1): 47. arXiv:1507.02388. Bibcode:2015ApJ...812...47U. doi:10.1088/0004-637X/812/1/47. ^ Burrows, Adam; Hubbard, W. B; Lunine, J. I; Liebert, James; Henning, T; Dullemond, C. P (2005). "The Onset of Planet Formation in Brown Dwarf Disks". Science. 310 (5749): 834–6. arXiv:astro-ph/0511420. Bibcode:2005Sci...310..834A. doi:10.1126/science.1118042. PMID 16239438. ^ a b Burrows, Adam; Hubbard, W. B; Lunine, J. I; Liebert, James (2011). "Tidal evolution of planets around brown dwarfs". Astronomy & Astrophysics. 535: A94. arXiv:1109.2906. Bibcode:2011A&A...535A..94B. doi:10.1051/0004-6361/201117734. ^ Burrows, Adam; Hubbard, W. B; Lunine, J. I; Liebert, James (2013). "The Atomic and Molecular Content of Disks Around Very Low-mass Stars and Brown Dwarfs". The Astrophysical Journal. 779 (2): 178. arXiv:1311.1228. Bibcode:2013ApJ...779..178P. doi:10.1088/0004-637X/779/2/178. ^ Burrows, Adam; Hubbard, W. B; Lunine, J. I; Liebert, James (2016). "First limits on the occurrence rate of short-period planets orbiting brown dwarfs". Monthly Notices of the Royal Astronomical Society. 464 (3): 2687–2697. arXiv:1609.05053. Bibcode:2017MNRAS.464.2687H. doi:10.1093/mnras/stw2391. ^ Barnes, Rory; Heller, René (2011). "Habitable Planets Around White and Brown Dwarfs: The Perils of a Cooling Primary". Astrobiology. 13 (3): 279–291. arXiv:1211.6467. Bibcode:2013AsBio..13..279B. doi:10.1089/ast.2012.0867. PMC 3612282. PMID 23537137. ^ Maxted P. F. L.; et al. (2006). "Survival of a brown dwarf after engulfment by a red giant star". Nature (Submitted manuscript). 442 (7102): 543–5. arXiv:astro-ph/0608054. Bibcode:2006Natur.442..543M. doi:10.1038/nature04987. PMID 16885979. ^ David Morrison (August 2, 2011). "Scientists today no longer think an object like Nemesis could exist". NASA Ask An Astrobiologist. Archived from the original on December 13, 2012. Retrieved 2011-10-22. ^ Basri, Gibor; Martin, Eduardo (1999). "[astro-ph/9908015] PPl 15: The First Brown Dwarf Spectroscopic Binary". The Astronomical Journal. 118 (5): 2460–2465. arXiv:astro-ph/9908015. Bibcode:1999AJ....118.2460B. doi:10.1086/301079. ^ Stassun, Keivan G; Mathieu, Robert D; Valenti, Jeff A (2006-03-16). "Discovery of two young brown dwarfs in an eclipsing binary system". Nature. 440 (7082): 311–314. Bibcode:2006Natur.440..311S. doi:10.1038/nature04570. PMID 16541067. ^ Stassun, Keivan G.; Mathieu, Robert D.; Valenti, Jeff A. (2007). "A Surprising Reversal of Temperatures in the Brown-Dwarf Eclipsing Binary 2MASS J05352184-0546085". The Astrophysical Journal. 664 (2): 1154–1166. arXiv:0704.3106. Bibcode:2007ApJ...664.1154S. doi:10.1086/519231. ^ "eso0303 – Discovery of Nearest Known Brown Dwarf". ESO. 2003-01-13. Archived from the original on October 13, 2008. Retrieved 2013-03-16. ^ Burrows, Adam; Hubbard, W. B; Lunine, J. I; Liebert, James (2004). "A possible third component in the L dwarf binary system DENIS-P J020529.0-115925 discovered with the Hubble Space Telescope". The Astronomical Journal. 129 (1): 511–517. arXiv:astro-ph/0410226. Bibcode:2005AJ....129..511B. doi:10.1086/426559. ^ a b Ben Burningham; Pinfield; Leggett; Tamura; Lucas; Homeier; Day-Jones; Jones; Clarke; Ishii, M.; Kuzuhara, M.; Lodieu, N.; Zapatero Osorio, M. R.; Venemans, B. P.; Mortlock, D. J.; Barrado y Navascués, D.; Martin, E. L.; Magazzù, A. (2008). "Exploring the substellar temperature regime down to ~550K". Monthly Notices of the Royal Astronomical Society. 391: 320–333. arXiv:0806.0067. Bibcode:2008MNRAS.391..320B. doi:10.1111/j.1365-2966.2008.13885.x. ^ Route, Matthew; Wolszczan, Alex (2012). "The Arecibo Detection of the Coolest Radio-flaring Brown Dwarf". The Astrophysical Journal. 2012 (747): L22. arXiv:1202.1287. Bibcode:2012ApJ...747L..22R. doi:10.1088/2041-8205/747/2/L22. ^ Wolszczan, A.; Route, M. (2014). "Timing Analysis of the Periodic Radio and Optical Brightness Variations of the Ultracool Dwarf, TVLM 513-46546". The Astrophysical Journal. 788 (1): 23. arXiv:1404.4682. Bibcode:2014ApJ...788...23W. doi:10.1088/0004-637X/788/1/23. ^ a b Zhang, ZengHua; Homeier, Derek; Pinfield, David J.; Lodieu, Nicolas; Jones, Hugh R. A.; Pavlenko, Yakiv V. (2017-06-11). "Primeval very low-mass stars and brown dwarfs - II. The most metal-poor substellar object". Monthly Notices of the Royal Astronomical Society. 468 (1): 261. arXiv:1702.02001. Bibcode:2017MNRAS.468..261Z. doi:10.1093/mnras/stx350. ^ "Teeny-weeny star vies for title of smallest known". Science News. 12 July 2017. Retrieved 21 November 2017. ^ von Boetticher, Alexander; Triaud, Amaury H. M. J; Queloz, Didier; Gill, Sam; Lendl, Monika; Delrez, Laetitia; Anderson, David R; Collier Cameron, Andrew; Faedi, Francesca; Gillon, Michaël; Gómez Maqueo Chew, Yilen; Hebb, Leslie; Hellier, Coel; Jehin, Emmanuël; Maxted, Pierre F. L; Martin, David V; Pepe, Francesco; Pollacco, Don; Ségransan, Damien; Smalley, Barry; Udry, Stéphane; West, Richard (2017). "The EBLM project". Astronomy & Astrophysics. 604: L6. arXiv:1706.08781. Bibcode:2017A&A...604L...6V. doi:10.1051/0004-6361/201731107. ^ Route, Matthew; Wolszczan, Alexander (2016). "Radio Flaring from the T6 Dwarf WISEPC J112254.73+255021.5 with a Possible Ultra-short Periodicity". The Astrophysical Journal. 2016 (821): L21. arXiv:1604.04543. Bibcode:2016ApJ...821L..21R. doi:10.3847/2041-8205/821/2/L21. ^ Masters, Daniel; McCarthy, Patrick; Burgasser, Adam J.; Hathi, Nimish P.; Malkan, Matthew; Ross, Nathaniel R.; Siana, Brian; Scarlata, Claudia; Henry, Alaina; Colbert, James; Atek, Hakim; Rafelski, Marc; Teplitz, Harry; Bunker, Andrew; Dressler, Alan (2012-04-27). "Discovery of Three Distant, Cold Brown Dwarfs in the WFC3 Infrared Spectroscopic Parallels Survey". The Astrophysical Journal. 752 (1): L14. arXiv:1204.6320. Bibcode:2012ApJ...752L..14M. doi:10.1088/2041-8205/752/1/L14. ^ "NASA's Spitzer and WISE Telescopes Find Close, Cold Neighbor of Sun". 2015-02-18. ^ "ESA Portal – Exoplanet hunt update". Esa.int. Retrieved 2013-03-16. Look up brown dwarf in Wiktionary, the free dictionary. 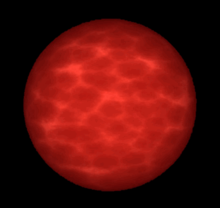 Wikimedia Commons has media related to Brown dwarf. Allard, France; Homeier, Derek (2007). "Brown dwarfs". Scholarpedia. 2 (12): 4475. Bibcode:2007SchpJ...2.4475A. doi:10.4249/scholarpedia.4475.